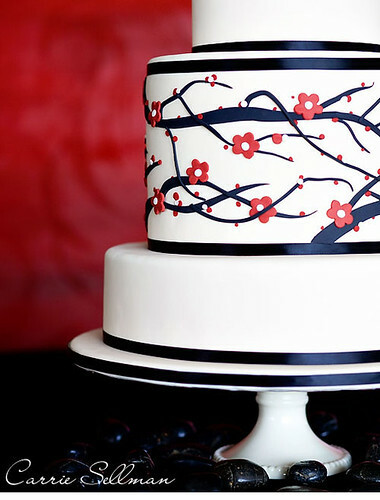 CakeSpy: First off--tell us a bit about who you are. Half Baked Cake Blog: My name is Carrie Sellman. I’m a cake designer and former specialty cake shop owner, now turned blogger. Most importantly, I’m a lover of all things cake! CS: What is your first cake memory? HB: Growing up, my mother always went out of her way to celebrate family birthdays. There was always party decorations, our favorite meal and of course, cake! I have such great memories of my childhood birthdays! Making a wish and blowing out candles. Chocolate cake was always the staple for my family. Ironically now as an adult, I prefer something lighter when it comes to cake. CS: Your site mentions that you are self-taught. How did you develop an interest in cake decorating? HB: When I was about 10, I got my first set of cake decorating tips and a pastry bag from the craft store. I made my dad a character cake of a golfer for father’s day. You know my star tip got a workout on that cake! I’m sure there is a picture somewhere… but let’s just say that my talent was not yet at full potential. Fast forward many years through college and a career in IT. I started to think that my hobby could be something more. Thanks to the encouragement of my husband, family and friends, I decided to go for it! CS: You closed your business in Dallas to relocate--any plans to open a new location where you are now, in Illinois? CS: Do you find that the baking scene is different in Illinois than in Dallas? How so? HB: Most definitely. I think all trends tend to hit the big cities first and then spread throughout the rest of the country. The cupcake trend is just now settling in here. I think it will be a little while before cake design, as I know it, will be in demand. I wonder if the high costs inherently associated to a cake that requires such intensive labor will prevent modern cake design from ever truly becoming popular here. But what do I know! CS: Fondant seems to be a type of icing that can often taste...well, not good. Do you have any tips for making it more delicious--recipes, types to use, things not to do, etc? HB: You would not believe the number of clients who love how fondant looks but prefer the taste of buttercream. Most often my solution is to give them a little bit of both. The majority of my cake designs have a buttercream base icing with fondant accents only (i.e. the stripes, polka dots, flowers, bows, etc). The perfectionist in me spends way too much time smoothing the buttercream to give it that porcelain look, but I think it is worth it. The end result is a stunning cake that still tastes good! If I cover the entire cake in fondant, then I use Satin Ice and I roll it as thin as possible. CS: Tell us about one of your personal favorite cakes that you've made. HB: It’s really hard to pick a favorite. It seemed like I used to have a new favorite each week! But one of my all time favorites is a design that I created for Bride & Bloom Magazine (pictured top of the post). I was given basic guidance that the theme was Asian Contemporary and the colors were red and black. But other than that, I had complete creative control. I always feel that I do my best work when I have more freedom with the design. It was three tiered (one tall, two short) with ivory fondant and black satin ribbons. The cherry blossom pattern was inspired by a sleek and modern pillow from Crate & Barrel. We placed some black river rocks around the base of the cake stand for the photos, which was the perfect finishing touch. CS: Your blog focuses a lot on parties (at which cakes are consumed, natch). What role does cake play in a party? CS: How does your blog feed your cake obsession? HB: I truly miss owning my business, working with clients to design a cake for their event. You feel like such a part of their big day. I loved that! But my blog allows me to play a small role in my reader’s events. Whether it provides them with some inspiration or connects them with a fabulous cake designer in their area via our Top Tier Directory. And I get my cake fix by featuring hot new cake designs, the stunning events where they were enjoyed, and the talented artists behind the cakes. Throw in some inspiration boards, real parties, insightful articles and fab finds. You’ve got yourself a party. Have I mentioned that I LOVE parties? For more sweetness, check out Carrie's site, Half Baked - The Cake Blog; you can also stay updated via twitter!